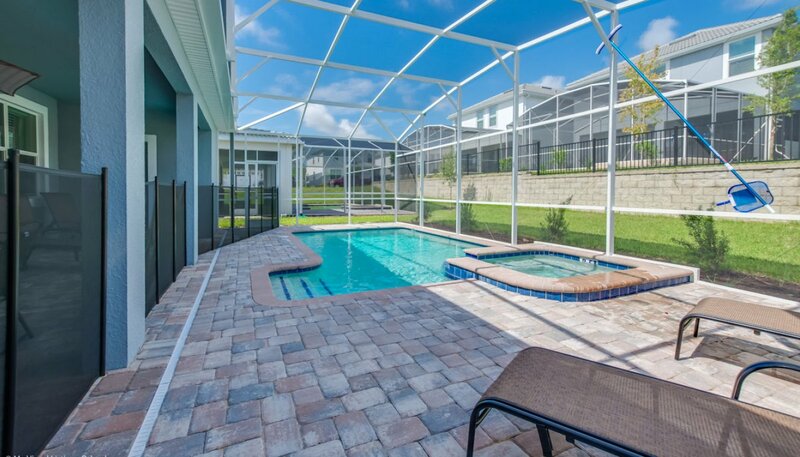 Brand new 6 bedroom, 6 bathroom villa with west facing sunny pool & spa. 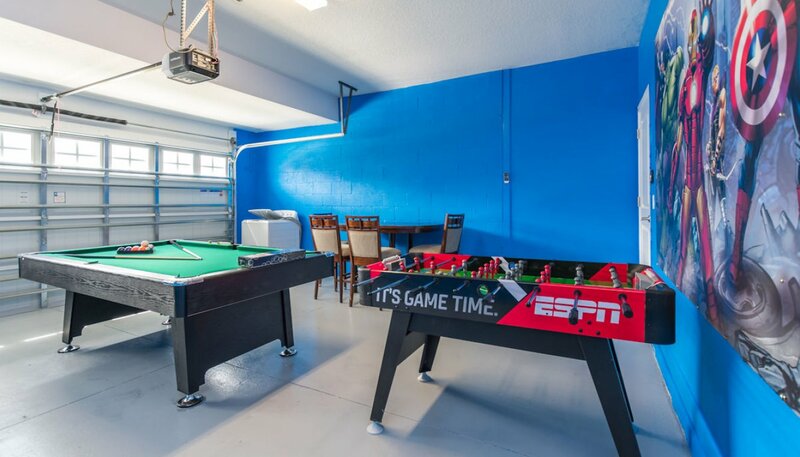 The villa is equipped with a games room (pool table & table foosball) plus an air hockey table in the family room. 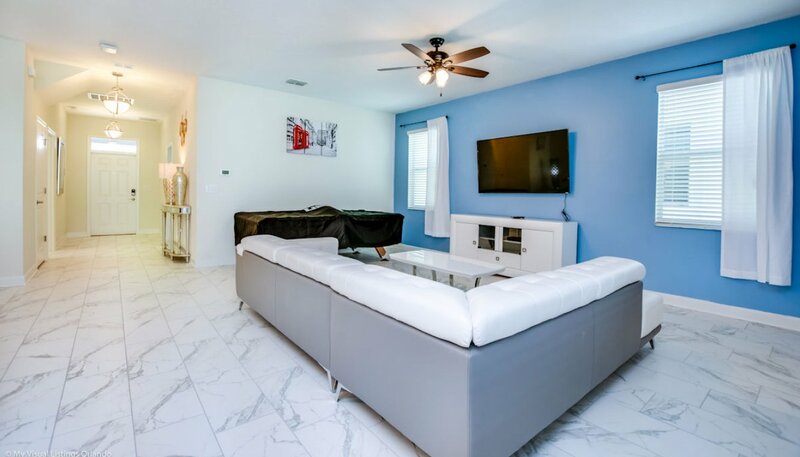 Upstairs there is an entertainment loft with large wall mounted LCD cable TV and every bedroom is equipped with a wall mounted LCD cable TV. 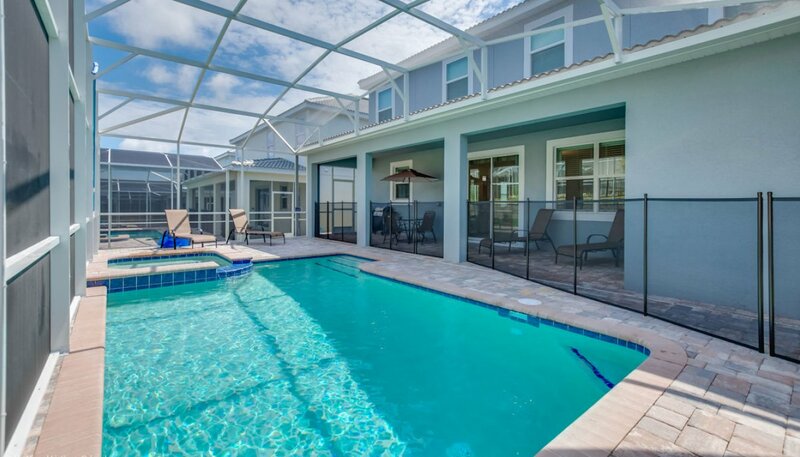 It's only a 10-minute walk to the excellent Oasis Club waterpark & resort facilities. 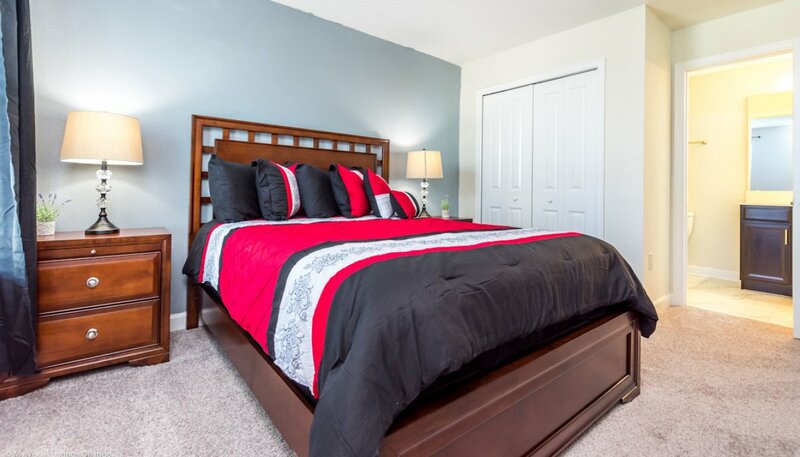 2 excellent golf courses are only a short drive away. 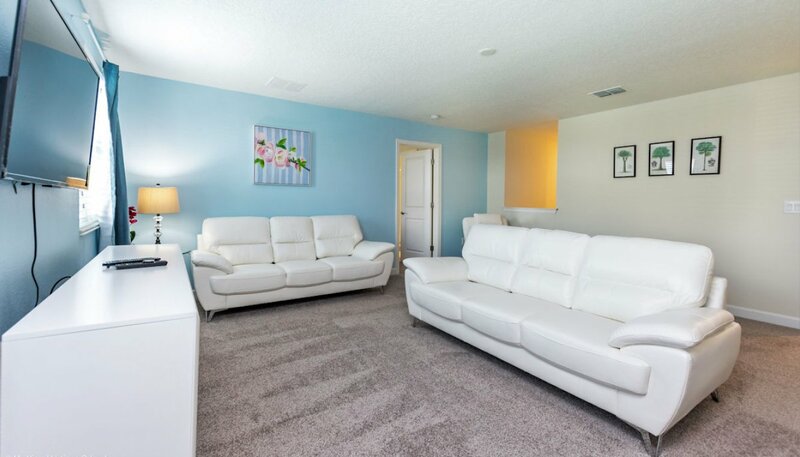 The comfortably furnished room with views to pool deck offers a comfortable white leather L-shaped sectional sofa for all to relax and watch the large wall mounted LCD cable TV. 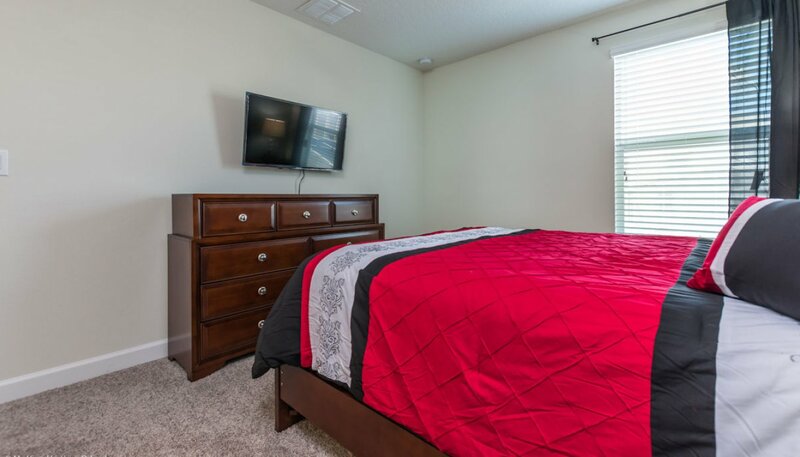 For your additional comfort, there is a ceiling fan. 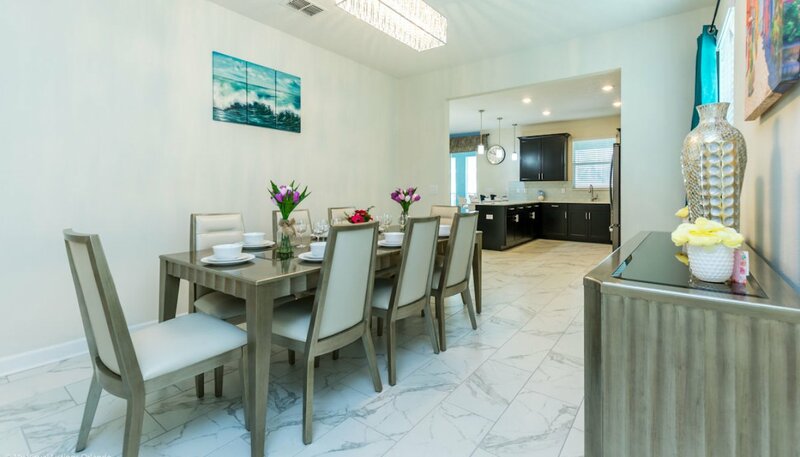 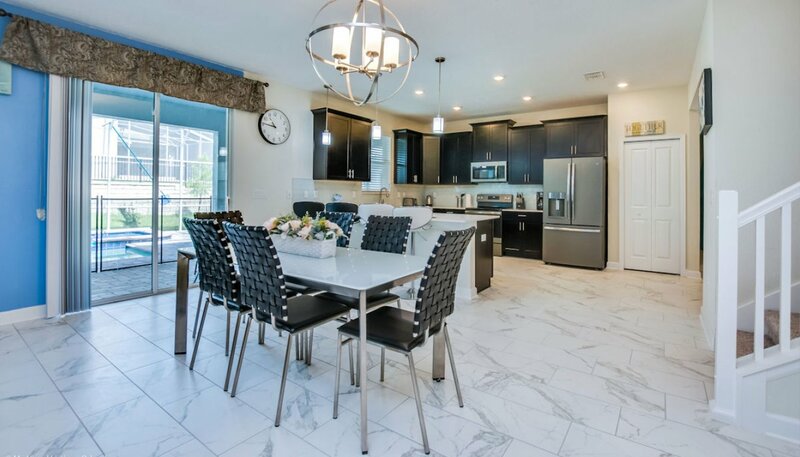 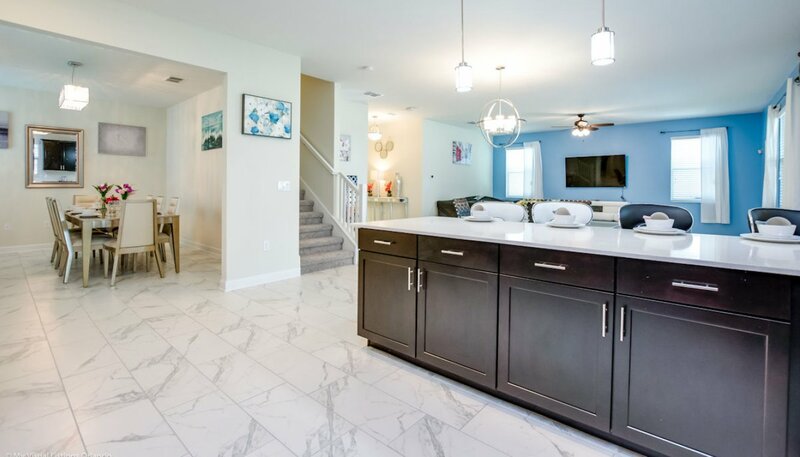 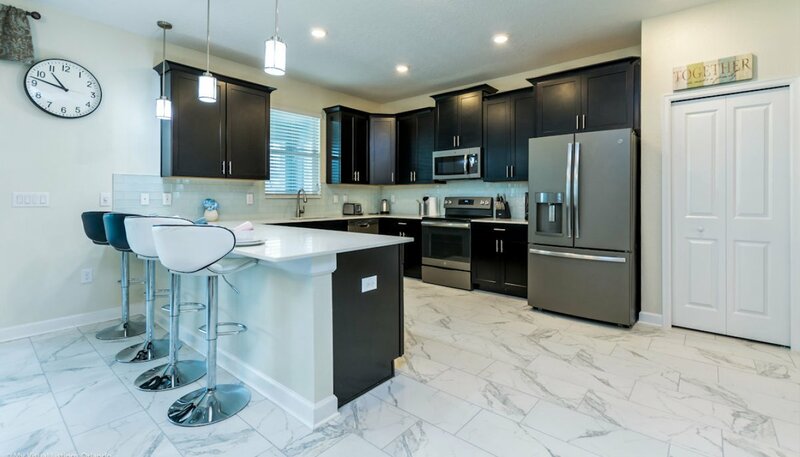 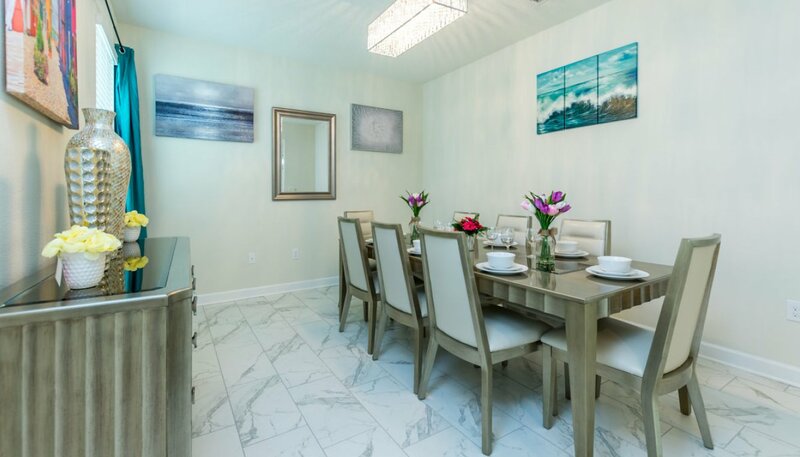 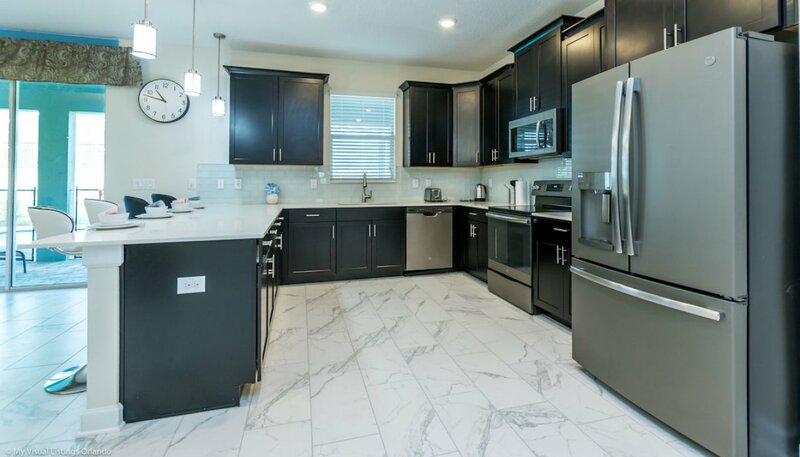 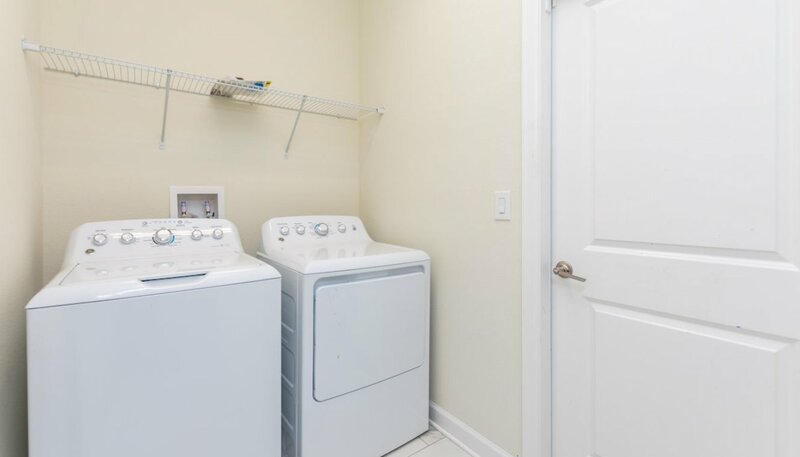 The luxury kitchen with Corian countertops and stainless steel appliances has all the amenities including dishwasher, stove with oven, microwave, refrigerator & freezer with automatic water and ice dispenser, waste disposal, coffee maker, blender, toaster & kettle. 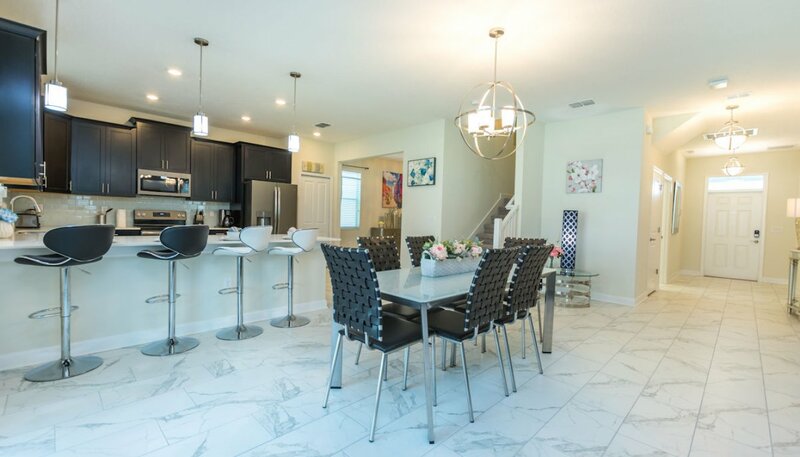 The breakfast nook sandwiched between the family room and kitchen comes with is a table and 6 chairs. 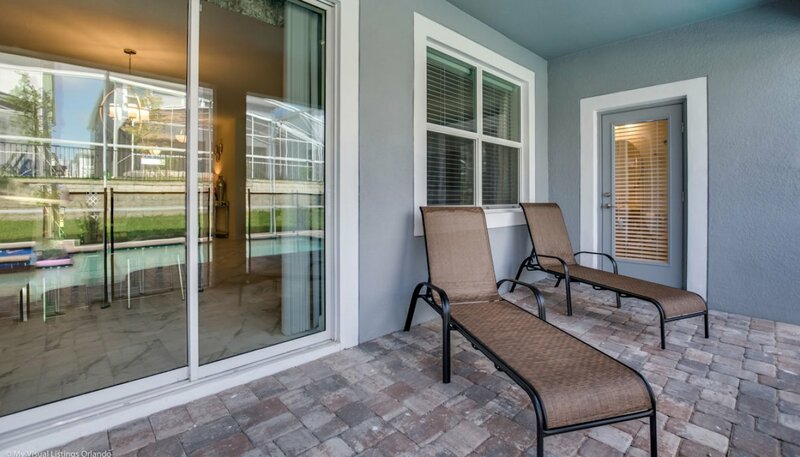 Sliding patio doors lead out onto the pool deck. 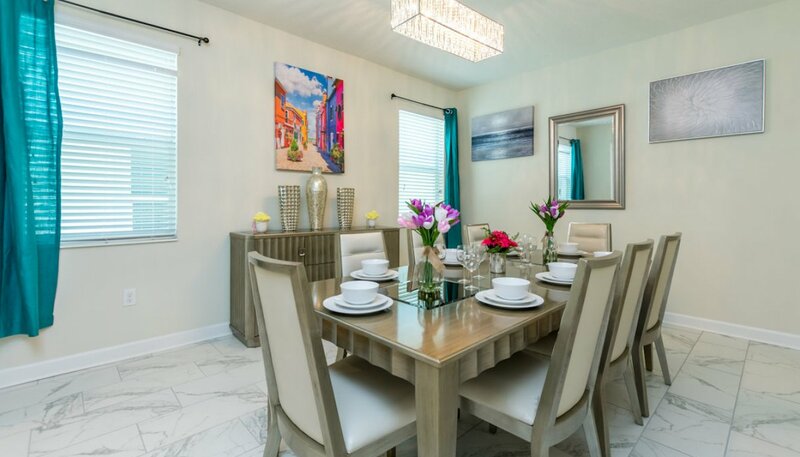 This beautifully decorated dining room off the kitchen offers a large dining table with 8 chairs and is ideal for large parties and formal dining. 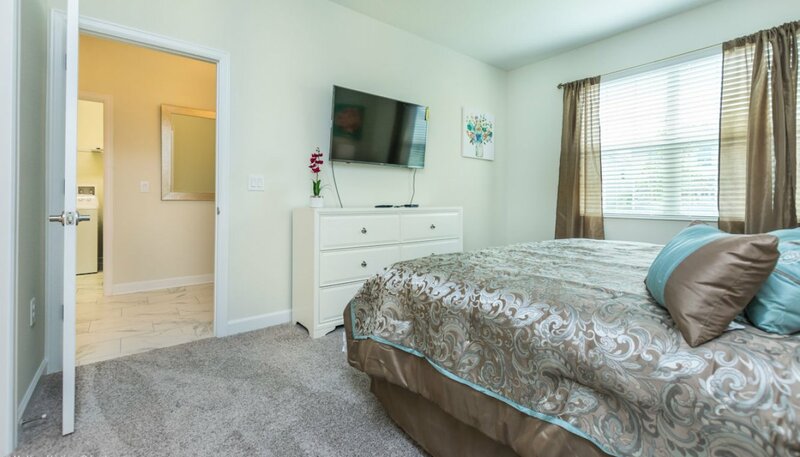 The second large master bedroom with its wonderful views over the front gardens has been furnished with a king sized bed, matching nightstands, chest of drawers, large built-in wardrobe and wall mounted LCD cable TV. 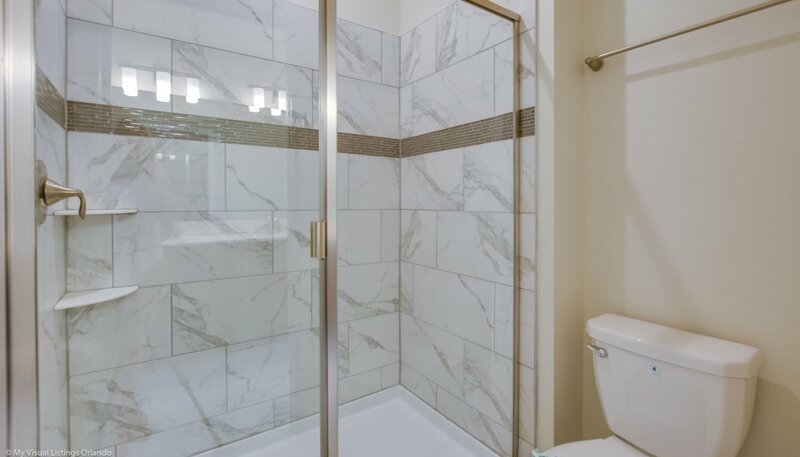 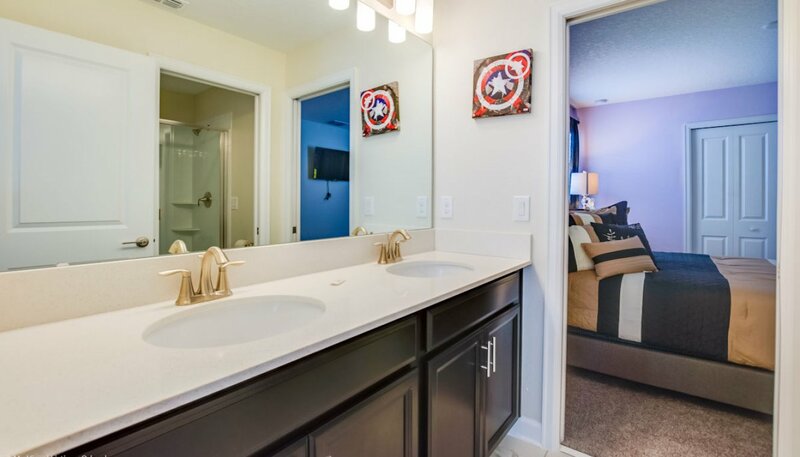 The connecting spacious ensuite bathroom has a walk-in double shower, inset his & hers sinks & WC. 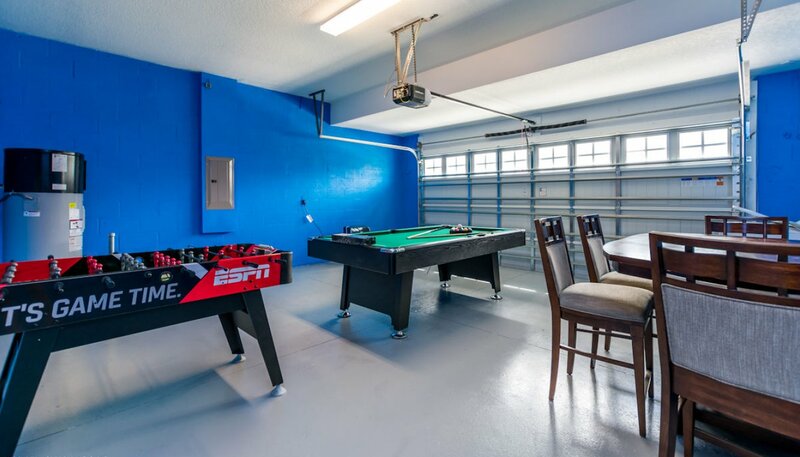 The games room is equipped with a variety of activities for all ages and interest. 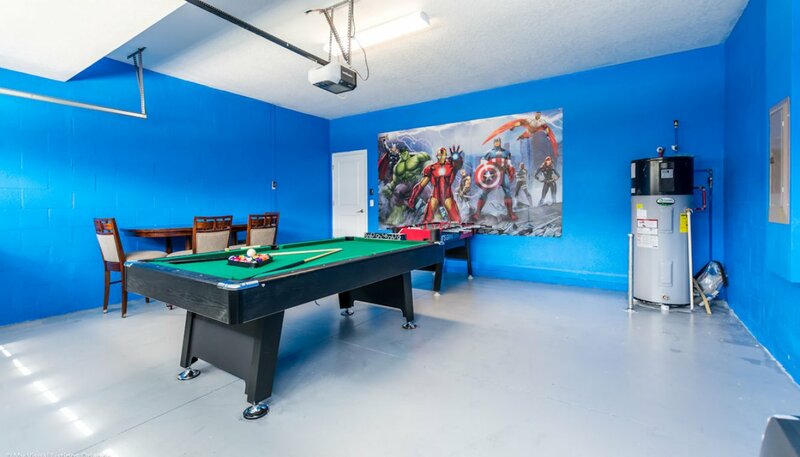 With an 8' pool table and table foosball. 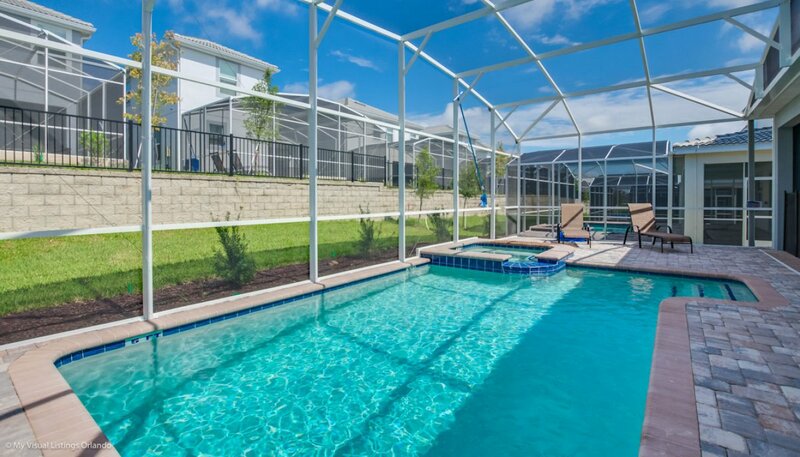 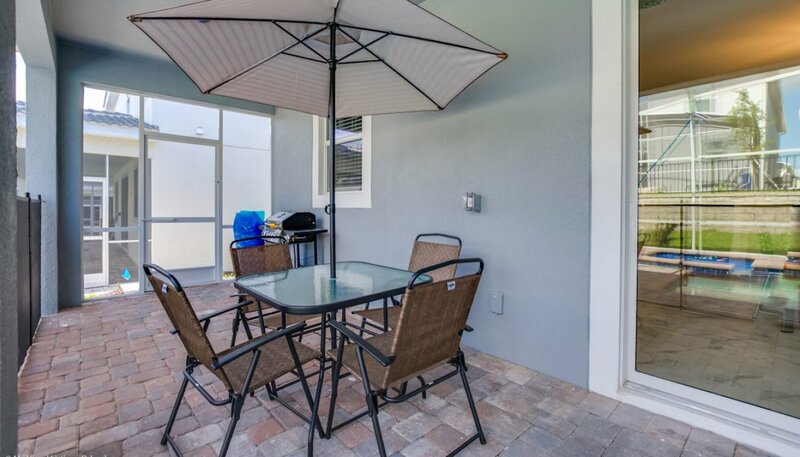 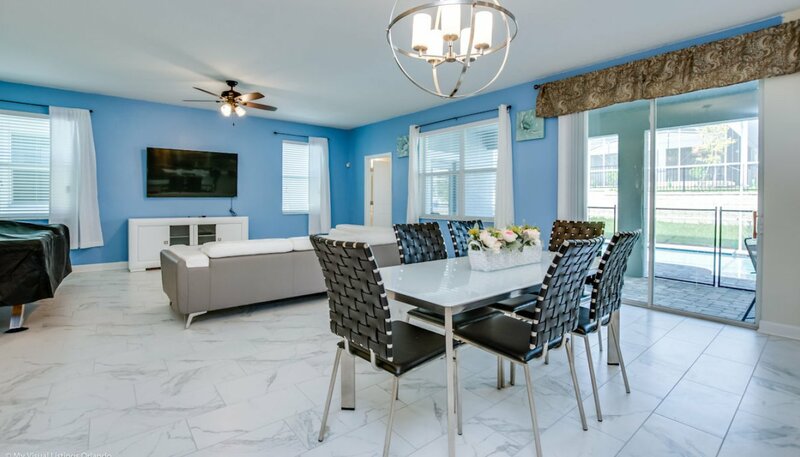 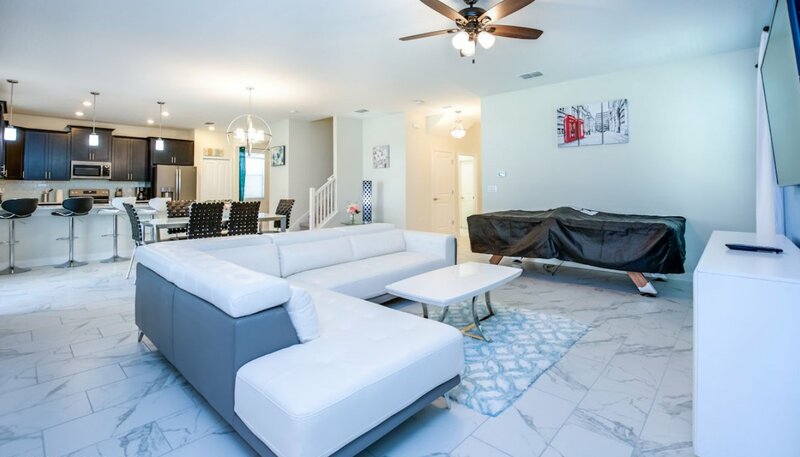 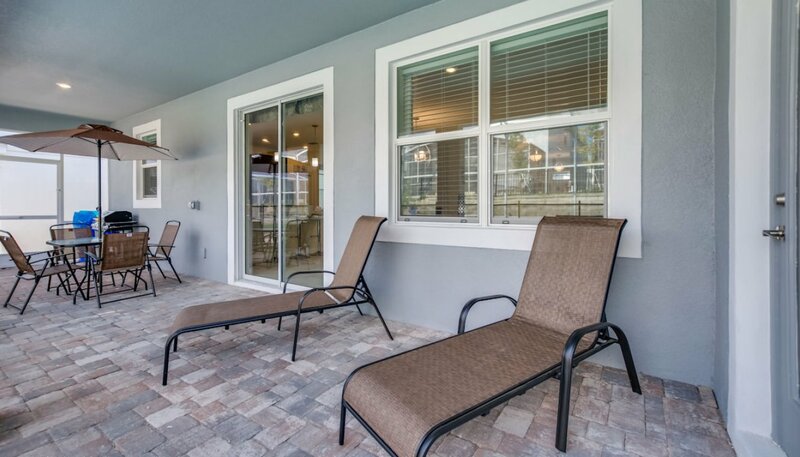 The large pool with sunny west facing deck has 4 sun loungers for your sunbathing comfort and a large patio table with 4 chairs under the shady covered lanai. 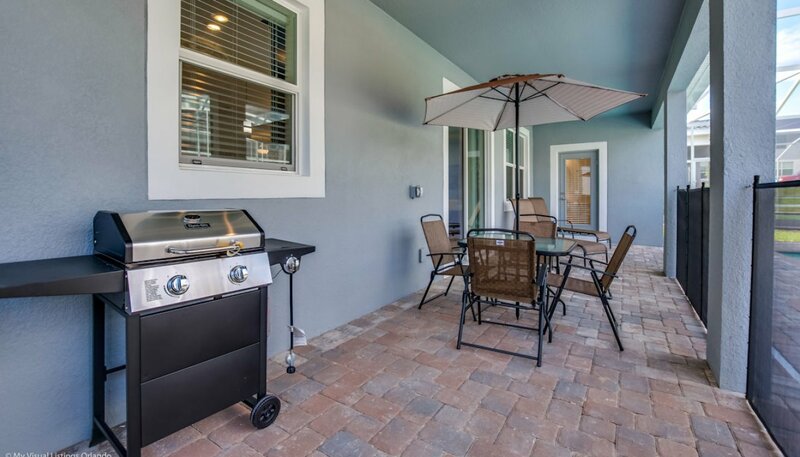 We provide a parasol should you wish to move the table out of the shade. 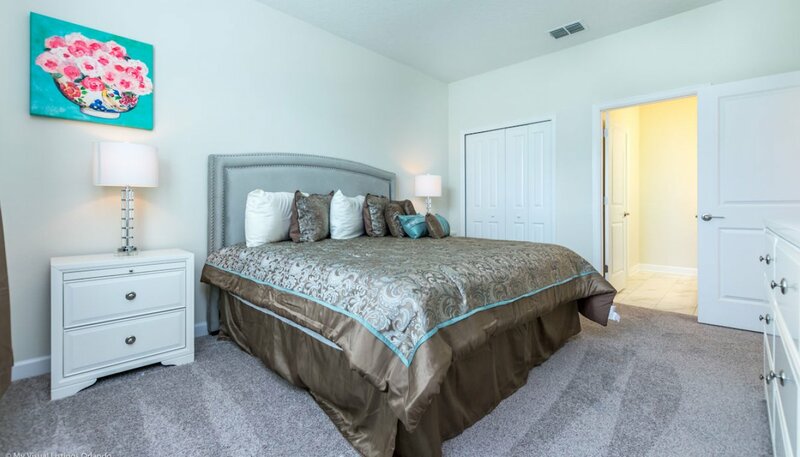 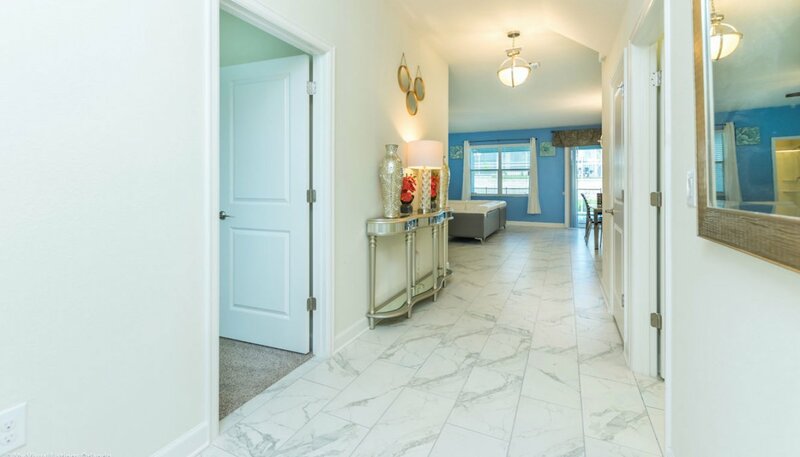 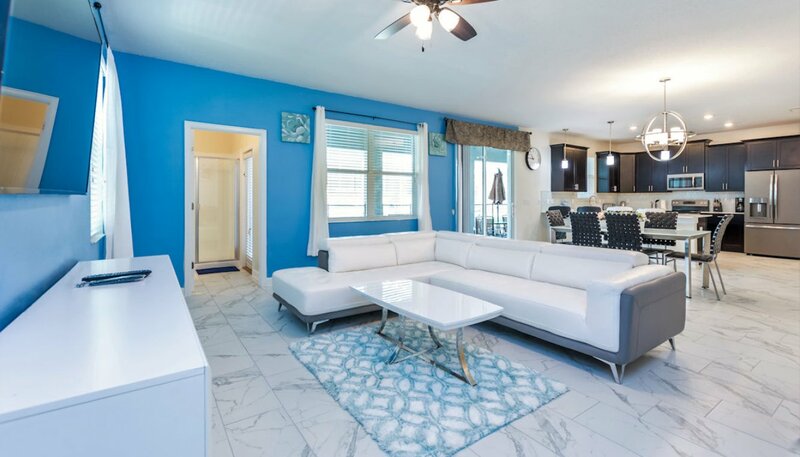 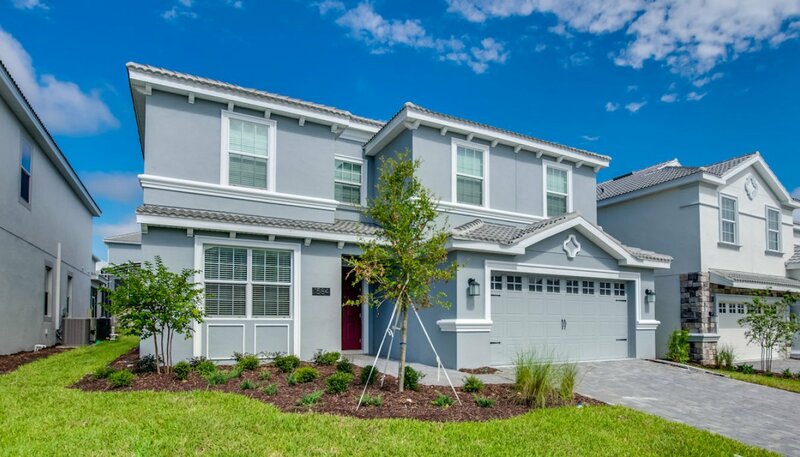 It is only a 10-minute walk to the excellent resort Oasis Club at ChampionsGate with its two pools including a waterpark with splash zone, lazy river, poolside tiki bar with cabanas, hot tubs, tennis, volleyball, and basketball courts, clubhouse bar and restaurant, games room, movie theatre, fitness centre, sundry shop and children's play center. 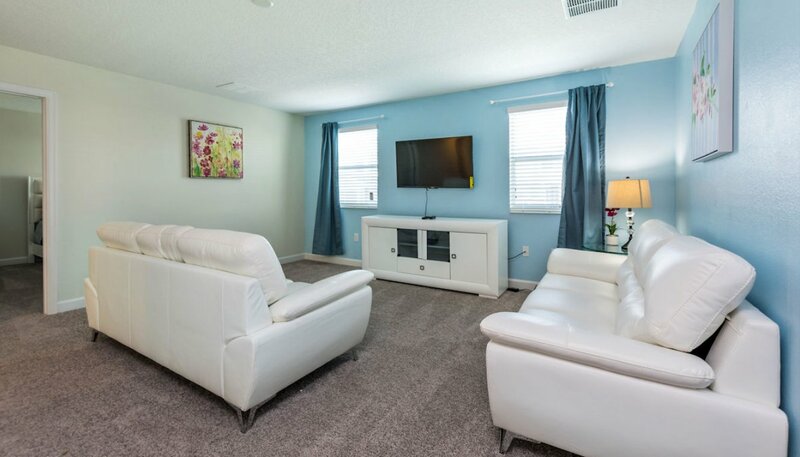 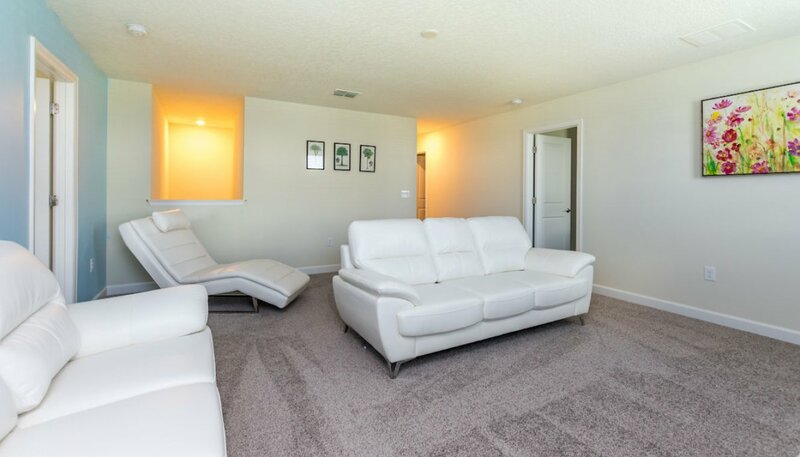 The large seating area located at the top of the stairs has 2 white leather sofas and chaise lounges providing comfortable seating to watch the large wall mounted LCD cable TV. 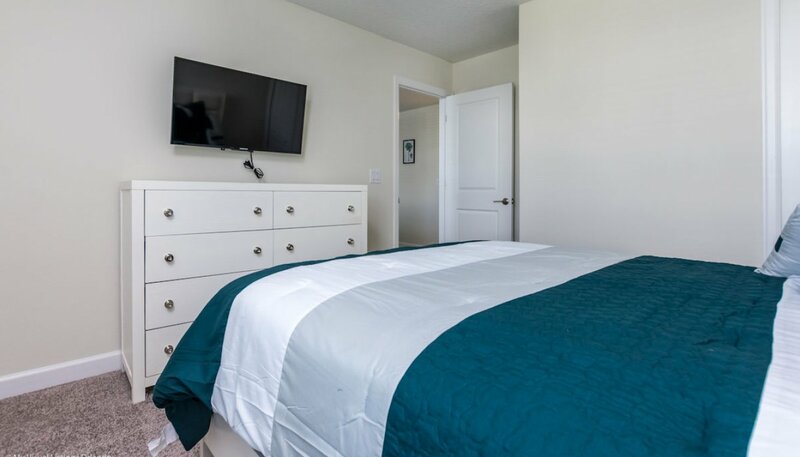 The large master bedroom with its wonderful views over the front gardens has been furnished with a king sized bed, matching nightstands, chest of drawers, large built-in wardrobe and wall mounted LCD cable TV. 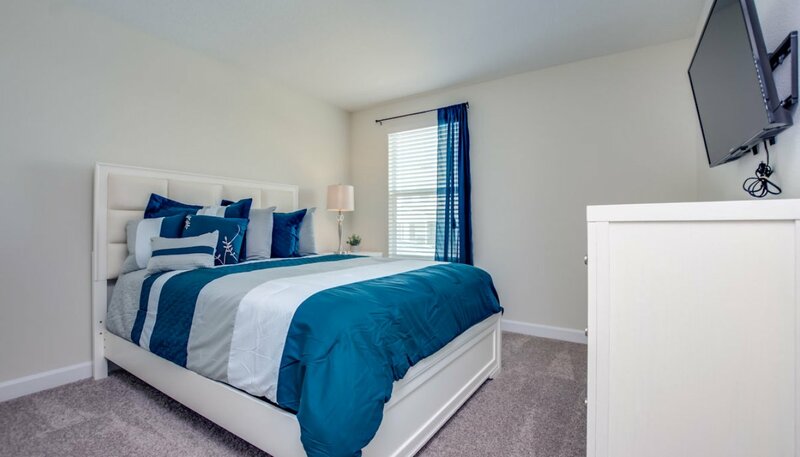 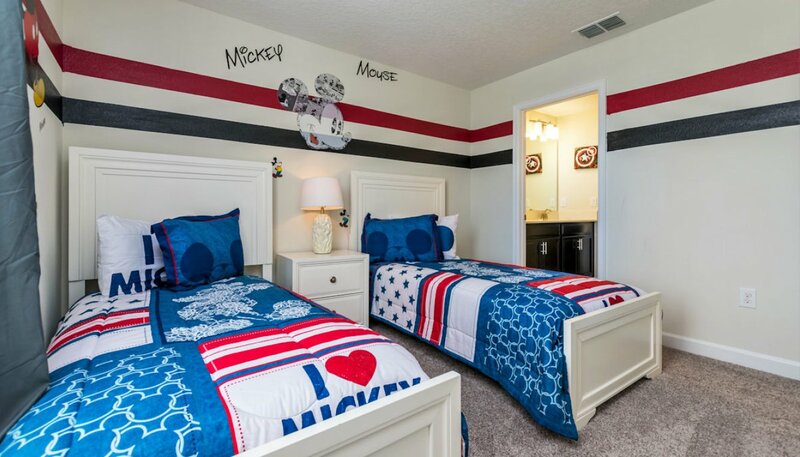 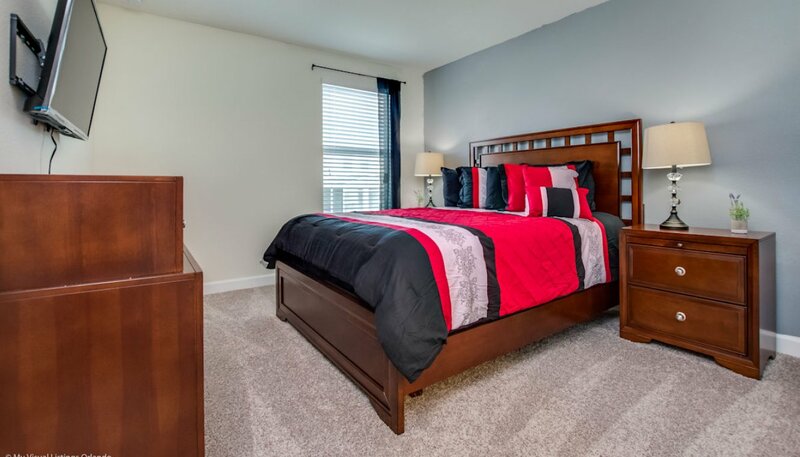 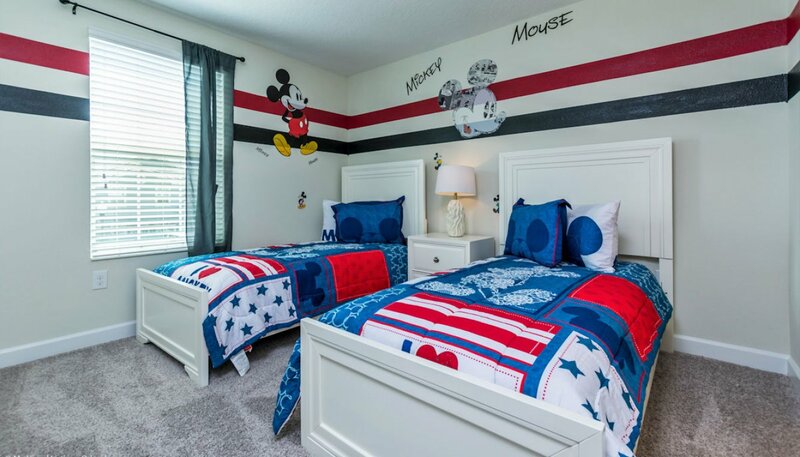 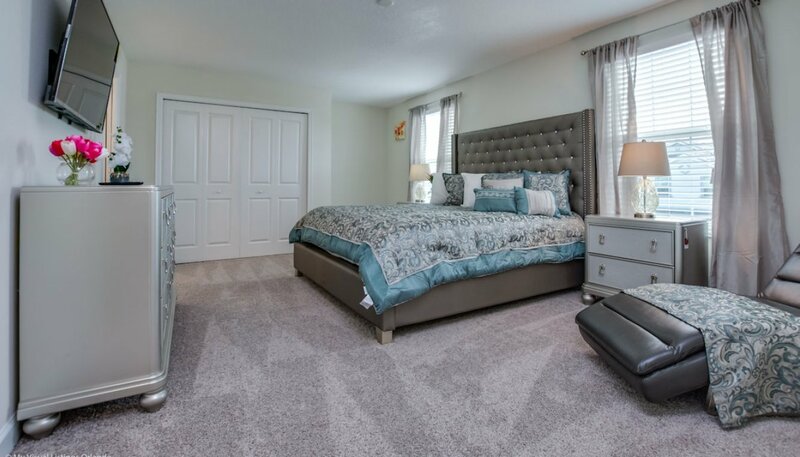 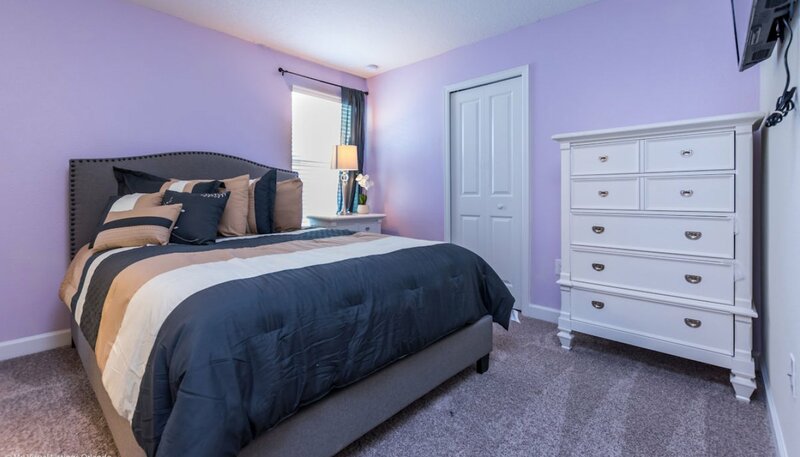 This Mickey themed bedroom comes equipped with twin sized beds with shared nightstand, chest of drawers with wall mounted LCD cable TV above and built-in wardrobe. 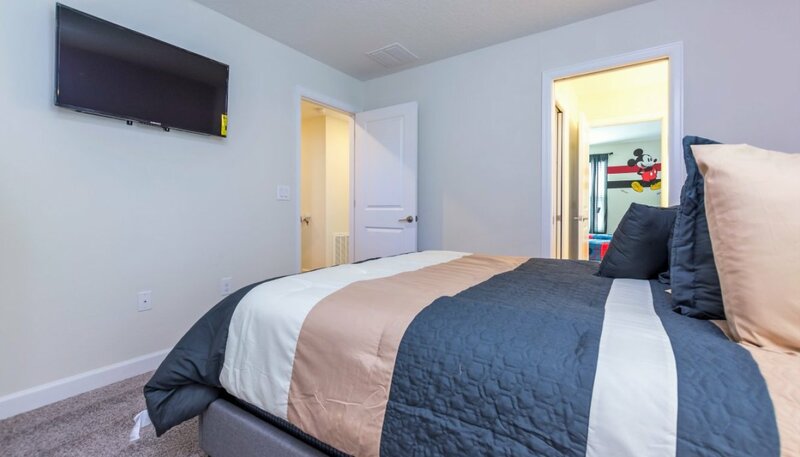 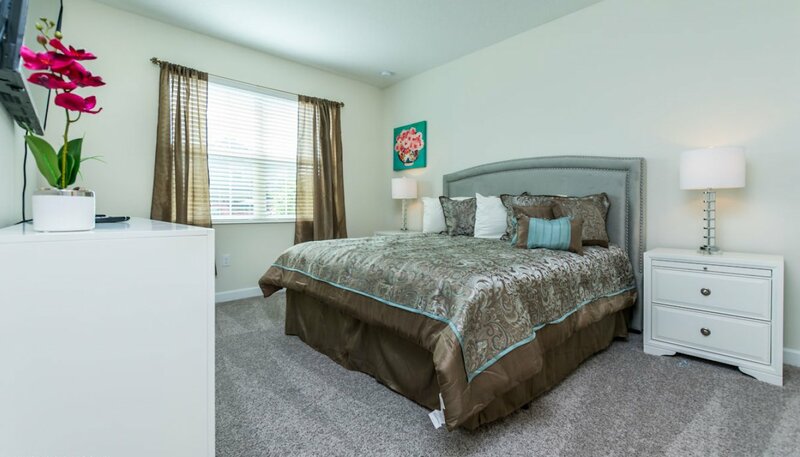 This bedroom comes equipped with a king-sized bed with single nightstand, chest of drawers with wall mounted LCD cable TV above and built-in wardrobe. 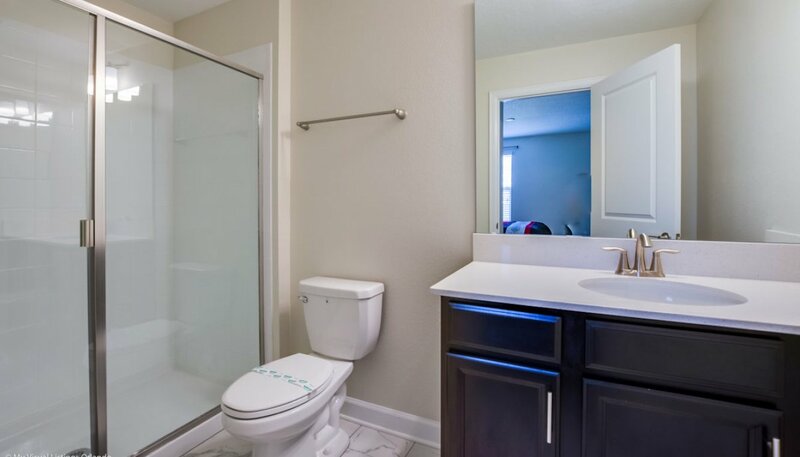 The Jack & Jill bathroom serves both bedrooms 3 & 4 and features a walk-in shower cubicle, his & hers vanities and WC. 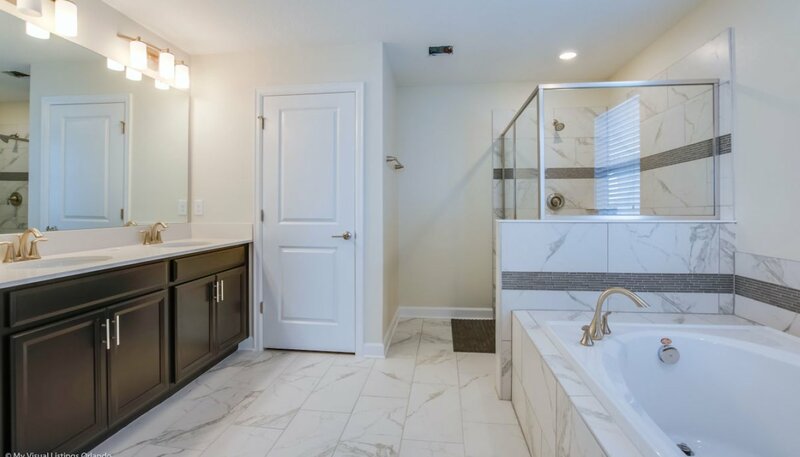 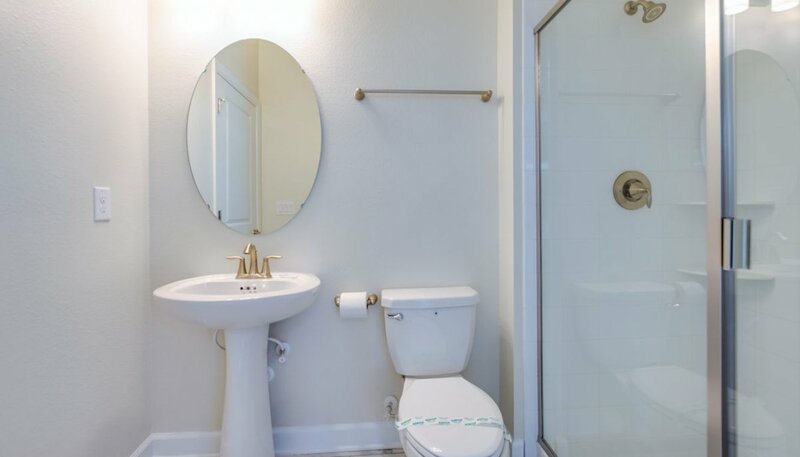 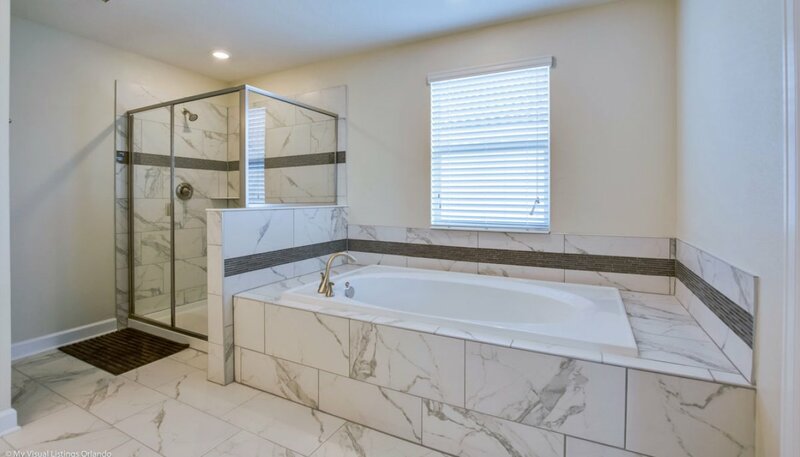 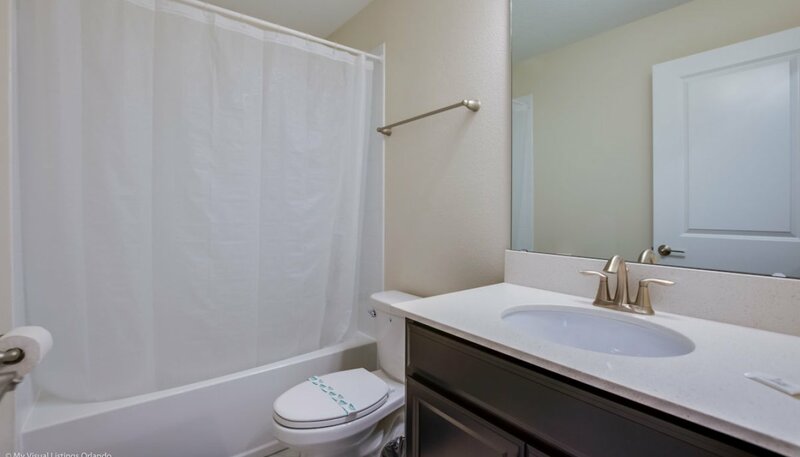 This bathroom serves bedroom 5 and the loft area and comes with a bath with shower over, WC and built-in sink unit. 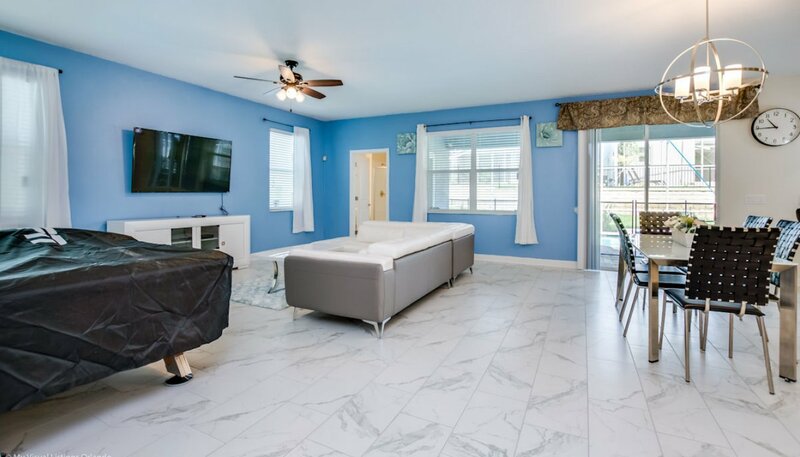 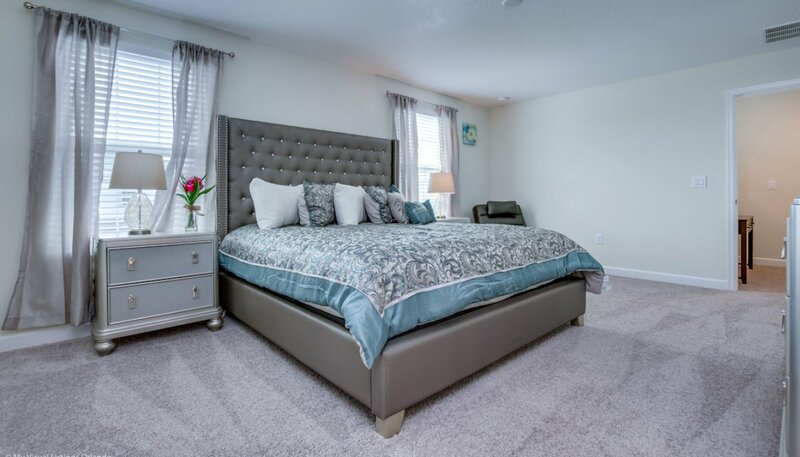 This bedroom with views over the pool deck has a king sized bed with matching nightstands, chest of drawers with wall mounted LCD cable TV above and built-in wardrobe. 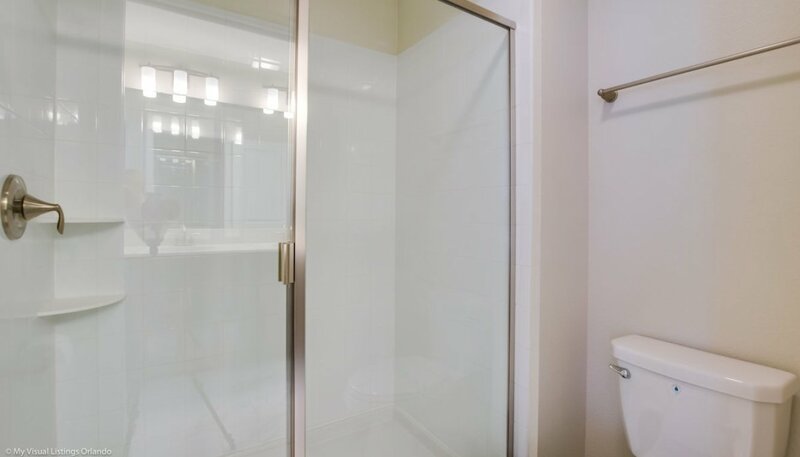 The ensuite bathroom with walk-in shower, single vanity and WC.